Discussion in 'Custom & Handmade Knives' started by Mifune326, Jun 5, 2018. I just wanted to give props to Matt at Wissahickon Knives for the beautiful Varg and Nessmuk that he crafted for my wife and I. I'm sure many of you have seen Matt's work on this forum. His knives get snatched up as soon as he posts them. They are absolutely beautiful works of art and feel unbelievably comfortable in the hand. Matt is a gentleman and a joy to deal with. You guys need to pick up a few of his knives. You won't be disappointed. I know that I'll definitely be picking more of Matt's blades up in the very near future! And I'm looking forward to checking out the new designs you have in store for us here on the BladeForums. Thank you again Matt and keep up the great work! LostViking and john april like this. Have his "Mapmaker." 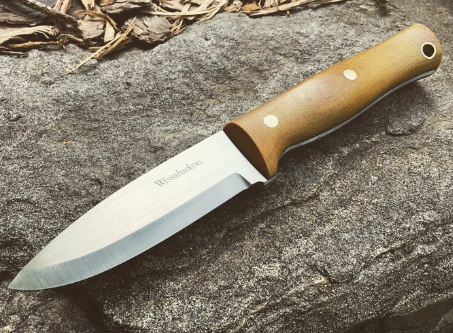 Great knife, starting with an A2 blade, super comfortable handle and nice leather sheath. 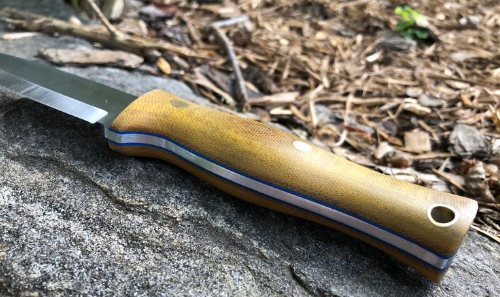 How about some pics of the knives he made for you? Gorgeous Mapmaker Thomas. Matt makes beautiful knives and he's a great dude also. Happy to have custody. Classic bushcrafter and came with a great sheath. I just ordered one. A twin to yours. I did look at some of the photos though. What is the purpose of Pinterest? All I see are pictures with no information. Show without tell? How does one "do" Pinterest? Sadly I have no idea. I don't do any of that stuff. No Face, no Twit, no Insta, no Pin. My on line social interaction exists mostly here on on BCUSA. The two sites cross well and seem to support each other. They are comprised of many talented and knowledgable people. Who have like minded interests. I enjoy what I see and read on both sites. The rest is a non-starter for me. This may sound harsh. But I don't care if cousin Nikki's daughter got a B+ on her spelling test. Folks are always worried about the Government collecting information on them. Then they turn around and post up every aspect of their lives for all to see. In effect that is why I asked you if you liked your Mapmaker. I wanted some real world feedback from someone I know has been around a while. I live in a pretty rural spot. So even Youtube isn't doable for me. Unless I want to take my bill into the stratosphere, which I don't. But even that is a challenge. I don't want to watch some person, be it boy or girl. Take a knife out of a box, and proceed to tell me how much they love it. They haven't even used it yet. How can they love it? If I'm looking at a knife. I already know the specs. So having them read to me has little meaning. I want to see and hear how folks like knives they use. Even if it's just cutting up a pork chop. At least that is real. Maybe I'm just getting old and cranky. But it seems to me it doesn't matter which medium you choose. Television, radio, print media, or social media. The signal to noise ratio is way to low to hold or even capture my attention. I gave my television away many years ago, and never looked back. I'd say probably north of 90% of everything out there these days is just noise.